This Banner is three and a half sheets. Welcome Sign with Large 8.5x11 Individual Letters. Download and print each letter on card stock. Just print and trim top edges of pages 2 and 3. Banners for other grades below.Banners are around 27 in. tall. Print classroom rules on one sheet or four sheets. Download each file and back with colored paper or card stock. 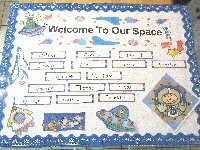 Welcome to Our Space - Space Theme bulletin board Print the banner file. Welcome to Our Space banner. The following files are also needed. Leap Into __ Grade. Download five files. Use this board for a variety of purposes. Use this banner with the stars above for a board to show spelling goals that have been reached. Small Balloons in black and white for students to color. Hot Air Balloon Name tags Print on shipping labels. Welcome to our School (banner)Students can color These Fish. Suggestion - run on different colors of cardstock and have children coior with markers for a bright colored bulletin board. Use blue background paper and sand colored paper at the bottom. Add more Sea Creatures. You also may want to use these Fish Tank Reward Charts. More colorful fish can be downloaded from Phillip Martins clip art. Print out Large Bees, Nameplates, and Banner. Enlarge Hive Pattern or print out Large Hive (9 sheets). If using for a door, cut as in this example here. Some words to add to door are here. Some Bee name tags are here. Keys To A Great Year Bulletin Board Banner Print the following keys Listen, Work Hard Respect Others, Follow Directions Do Your Best Back to School Picture Put other pictures of children listening, working, etc. A Great Line-Up Bulletin Board Large T-Shirt or Small T- Shirt. 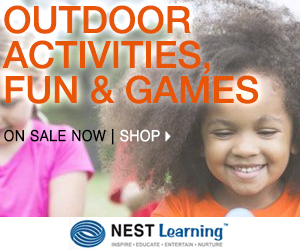 Use a blue background and string a clothesline between trees. Write the students names on shirts. Let's Get Acquainted (A Crossword Puzzle Board) You could put the students names into a Crossword Puzzle Maker then run off enough squares for all of the names. Lay out the squares in the shape of your puzzle and tape them together on the back.You could have a clue sheet telling something about each person. Welcome Back Puzzle Board I love this colorful bulletin board made by Susan Griffes.You could use this 24 Piece Template. Simply add an extra row or two if you have more students. Cut the shapes from bright colored card stock. Then use this banner Welcome Back You Fit Right In for the heading. 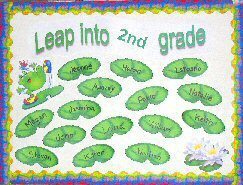 a kindergarten bulletin board. Print off These Yellow Flowers (three to a page). Take a digital picture of each child and place in the center of each flower. Pink Flowers are here. Ode To Fifth Grade This clever board was made by Susan Latino. The student's names are on the beginning notes of "Ode To Joy". The students are given a quiz sheet on the first day of school with several questions about the board. This site is from Garden of Praise. There are many boards here with photos. The boards are separated by grade level. Check the Bulletin Board Index Page for more bulletin boards and room decoration.